This year is flying by…Spring breaks are over and kids are down to their last month of school! 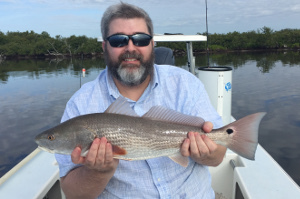 Fishing in the Mosquito Lagoon and Indian River is like days of old. 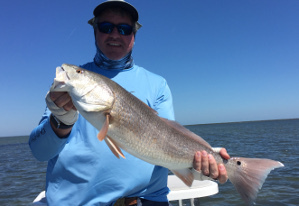 There is really clean water for sight fishing, big schools of redfish and black drum, trophy size trout cruising shallow grass flats, snook and tarpon around docks and the ICW. It’s shaping up to be a very promising summer. My calendars for May, June, and July are filling up quick…don’t be left out and wait till the last minute!!! 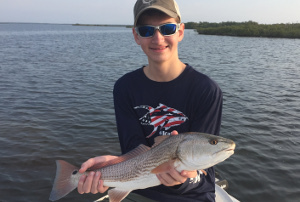 Fishing for redfish in Mosquito Lagoon during the past month has been phenomenal. There have been numerous big schools of fish on the grass flats in Mosquito Lagoon. 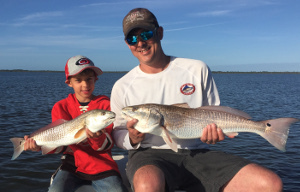 Sight casting with live shrimp, soft plastics, and spoons has put numerous redfish in the boat each day, with many trips landing over 10 fish. 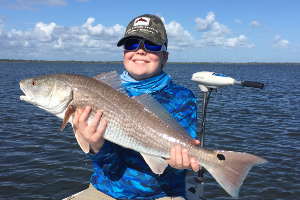 Closer to New Smyrna Beach and Ponce Inlet, schools have broken up with clusters of redfish in creeks and shallow mud flats. 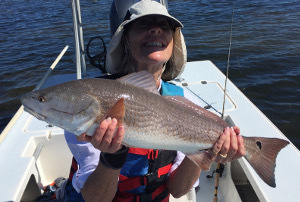 Bigger bull redfish over 20 pounds are starting to gather in schools in the ICW and the Indian River Lagoon for their annual summer spawn season. 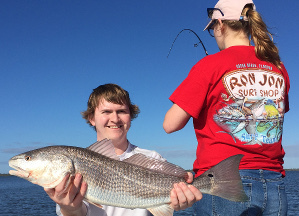 It’s only going to improve for these giant, trophy size, catch and release redfish through the summer and early fall. 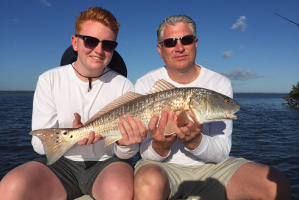 I offer the same advice every year…want to catch big speckled trout, you need to be here from mid-April through July. Warmer water temps and millions of baitfish equal ravenous big trout cruising shallow flats, bars, creeks and docks. 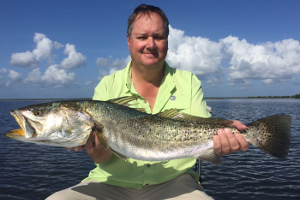 We’ve been seeing a ton of big trout while fishing for redfish on the shallow flats. One recent trip yielded a giant 33 inch gator trout. Another trip put a bunch of trout over 20 inches in the boat, with a few over 26 inches. Live bait gets the job done for us day in and day out on the big ones. Soft plastics and plugs will also catch a few. 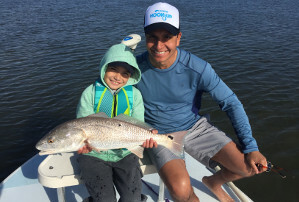 Black drum are in spring spawn mode and it seems everyone has been beating on big schools of them in the lower half of Mosquito Lagoon this year. Most of the fish are in the 5-10 pound range with a couple groups holding fish over 20 pounds. Live shrimp and crabs will catch you plenty. Snook have moved to their summer hangouts on docks, seawalls, and deeper shorelines around New Smyrna, Ponce Inlet and Port Orange. Catching will improve as we start to get more baitfish showing up and they move off the live shrimp choice. Average fish tend to run 4-5 pounds, but the area continues to see an annual increase in size with the occasional fish over 10-15 pounds being caught. It’s been such a warm winter that there are quite a few juvenile tarpon moving around in the channels, ICW, and deeper basins in the Mosquito Lagoon and Indian River. We recently jumped a couple smaller ones that were busting bait on the surface. Everything is in the 10-20 pound range, but bigger tarpon are already moving nearshore in the ocean over 50 pounds. Live shrimp, jigs and soft plastics do well during these early months.